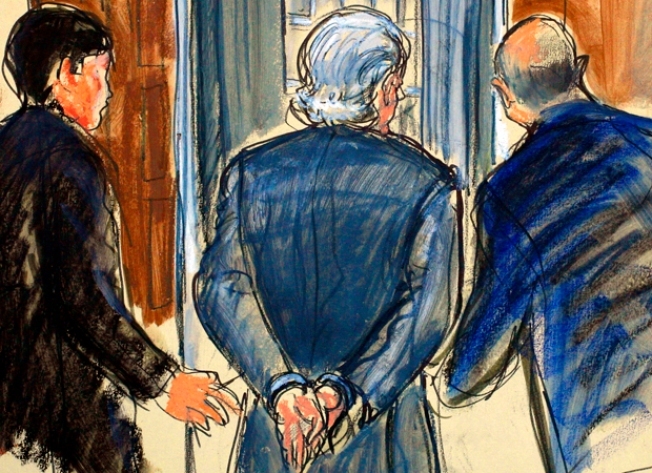 In this artist's sketch, Bernard Madoff is taken in handcuffs from a federal courtroom following a hearing Thursday. Say goodbye to the penthouse, Bernie. And hello to the Big House. Federal Court Judge Denny Chin revoked Bernard Madoff's bail this morning, ordering the disgraced financier to prison after he confessed to operating a $65-billion Ponzi scheme. The move was met with applause in a Manhattan courtroom, and Madoff was handcuffed and taken to jail. Madoff pleaded guilty to all felony counts, saying he was "deeply sorry and ashamed." "Your honor for many years ... I operated a Ponzi scheme," said Madoff. "I am grateful for this opportunity to speak" and explain that "I am deeply sorry and ashamed. I cannot adequately express how sorry I am for what I have done. " The plea ends a half-century career that saw him rise to Nasdaq chairman and one of Wall Street's elite, and could result in a maximum prison term of 150 years. Madoff, who was remanded to custody, faces sentencing on June 17. "How do you now plead to the information - guilty or not guilty?" asked Chin. "Guilty," said Madoff, standing without emotion, his hands at his side. For the judge to accept the guilty plea, Madoff needed to detail his crimes in his own words, which he did in a statement. "I also knowingly gave false testimony under oath" to the Securities Exchange Commission, Madoff said adding that his clients "receiving account statements had no way of knowing." While confessing his guilt, he sought to protect his family, saying "the other businesses were legitimate, profitable ...in all respects and those businesses were run by my brother and my sons." When Madoff concluded his statement, Chin accepted his guilty plea and asked his victims, who began arriving at court as early as 8 a.m., if they wished to be heard. At least one of Madoff's victims objected to the plea, saying "if we go to trial, we will show that we hold people accountable." "If we go to trial we have more of a chance to comprehend the global scope of this horrendous crime," said one Madoff victim. "No man, no matter who he knows or who he is able to influence, is above the law." Before the hearing, Adriane Biondo, 41, of Los Angeles, said five members of her family were affected by the fraud, including elderly relatives who were ruined. She went to court to see Madoff plead guilty and wants the judge to send him to prison immediately. "For him to be under penthouse arrest at this point ... is just not fair," she said. Madoff's current bail status "really infuriates everyone," said Matt Weinstein, a motivational speaker who lost the bulk of his savings in the scheme. "People can't even afford rent anymore," Weinstein said. "He can't go on in this palace of denial." In three months, Madoff has gone from a man known mostly as a pioneer of electronic trading in securities to an icon for disreputable money managers who live a life of affluence while fleecing those who entrust their life savings to their schemes. The FBI claimed Madoff admitted to his sons months ago that his once-revered investment fund was all a big lie, a $50 billion Ponzi scheme that wiped out life fortunes, school trusts and charities and apparently pushed at least two investors to commit suicide. The size of the scandal has made him an international symbol of greed and deception in difficult economic times. But it remains in dispute. Prosecutors filed papers Tuesday saying Madoff's investment company reported a total balance of $64.8 billion in November even though it actually had only a small fraction of that amount. Investigators say the true amount lost by investors may be between $10 billion and $17 billion and the larger estimates by Madoff include the false profits prosecutors say he generated with tens of thousands of bogus account statements cataloging steady profits. So far, authorities have located only about $1 billion in assets. Victims can get more information at bernardmadoffvictims.org. In a hearing Tuesday, the judge said he had been contacted by clients of Madoff's investment firm who complained — mistakenly — that he was benefiting from a plea deal. Prosecutors said there was no agreement that would have given him a shot at a lighter sentence in exchange for cooperating with investigators. "There is no plea bargain here," the judge said. Despite the plea, investigators say they still would face the daunting task of unraveling how Madoff pulled off the fraud for decades without being caught. They suspect his family and his top lieutenants, who helped run his operation from its midtown Manhattan headquarters, may have been involved. In court documents, prosecutors have indicated that low-level employees were in on the scam and may be cooperating. Court papers say Madoff hired many people with little or no training or experience in the securities industry to serve as a secretive "back office" for his investment advisory business. Prosecutors say he generated or had employees generate tens of thousands of account statements and other documents, operating a massive Ponzi scheme, a scam in which people are persuaded to invest in a fraudulent operation that promises unusually high returns. The money Madoff received was never invested but was used by him, his business and others or, as occurs in Ponzi schemes, was paid out to early investors, prosecutors said.